Wat Bang Phra is a Buddhist temple 50 Km west of Bangkok where the late abbot, Luan Phor Pern was famous for his tattooing skills. His work is now carried on by the temple monks. 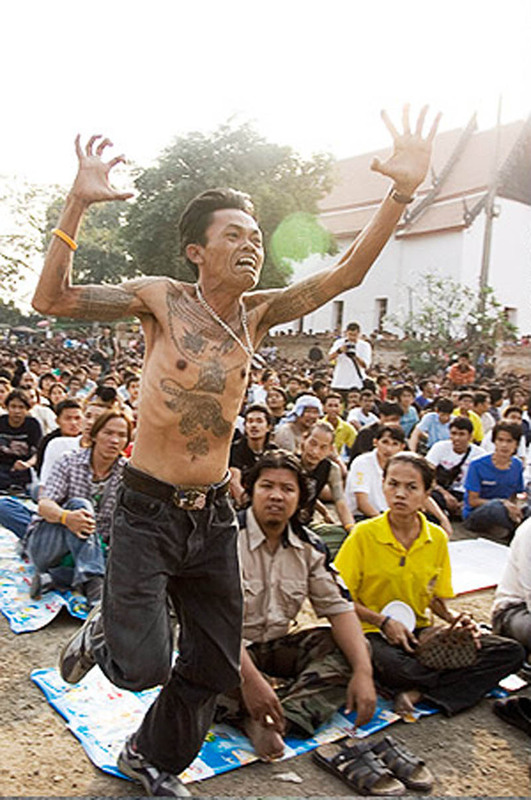 Every year, the Temple hosts a Tattoo festival for which thousands of young men with suspicious occupations gather. The tattoos, which consist of Buddhist texts, numerology charts, mythical creatures and characters form the ancient Sanskrit epic the Ramayana, are a Khmer tradition know as âyantraâ. The practice, has gradually integrated elements of Hinduism and Buddhism. The tattoos are said to have magical powers against knife and bullet wounds! Thus, the tattoos are popular with soldiers, policemen and, above all, members of Thailands underworld. Tattoo enthusiast, Hollywood star Angelina Jolie, has a yantra tattoo on her back.